Located in the Leeds/Bradford area and commissioned by a large Construction Company, this purpose built Modular Building complex consists of 6 No. 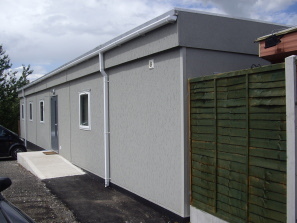 individually prefabricated modular bays providing a much needed site office complex (175 sq. metres) for their staff to manage a number of large construction projects in the area. The design of this Prefabricated Building provides 5 No. project offices of varying sizes, a large meeting room, reception area, waiting room and toilet facilities, including a fully equipped DDA compliant disabled toilet. A stationery store and fully equipped kitchen area are also provided. Externally, the walls are finished in a durable stiple texture coating and the roof is constructed with our standard duo pitched roofing system and covered with a hard wearing "Hypalon" blanket. Electric heaters keep the rooms at a constant temperature. Internally, the walls and ceilings are finished with a vinyl faced plasterboard and the internal doors are all solid core timber with closers and seals. The floors are covered throughout with high quality carpet tiles. Upon completion of the existing projects, the whole complex can be easily relocated to a new location. Helping Construction to manage their projects on time and on budget!